Christine and Collin: Seattle Wedding at Canlis Glass Studio and Ivar’s Salmon House » Seattle Wedding and Portrait Photographer: Kristen Honeycutt Photo Co.
Christine and Collin’s wedding took place on the most amazing Spring day in Seattle. And when you plan your wedding for the end of March, you’re also bound to get an arboretum full of gorgeous blooming cherry blossom trees. 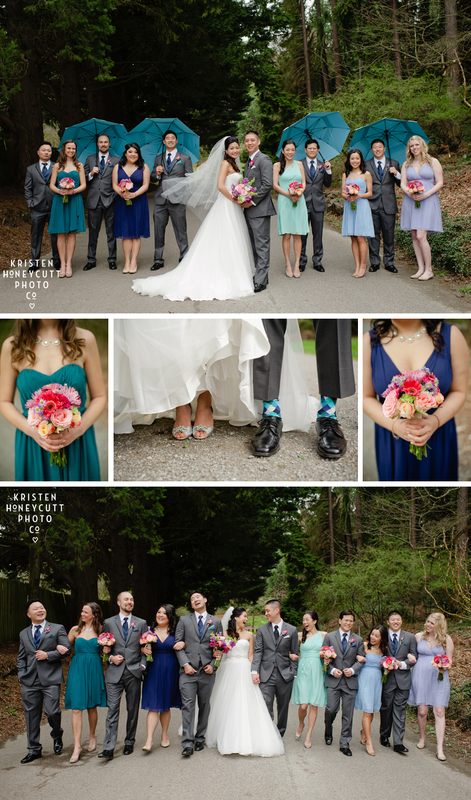 Their colorful spring palette of shades of blues and greens was stunning against the bright bouquets and the cherry blossom’s soft pink flowers. Such a great way to kick off my Spring weddings. We did portraits in Seattle’s Arboretum (with colorful streamers, big white balloons, and some bright blue umbrellas! ), and then made a quick stop at one of my favorite piers to catch a few portraits with the Seatle Great Wheel and the waterfront. Their intimate ceremony took place at Canlis Glass Studio in Belltown, followed by a fun and colorful reception at Ivar’s Salmon House on Lake Union. We ended the evening with a sparkler exit at sunset, and a few more portraits with that glowing Seattle skyline. Christine and Collin, I am so happy I could be there to watch as your friends and family celebrated your marriage. I hope these images remind you of all the joy and happiness that day. Photography: Kristen Honeycutt Photo Co.
And thank you Saskia for the awesome second shooting assistance! Christine - Gorgeous! You captured our wedding perfectly and we loved every photo!! Thank you so much, Kristen and Saskia! Denver Engagement Photographer - What a gorgeous setting to have a wedding. Those blossoms are so pretty! Great work!